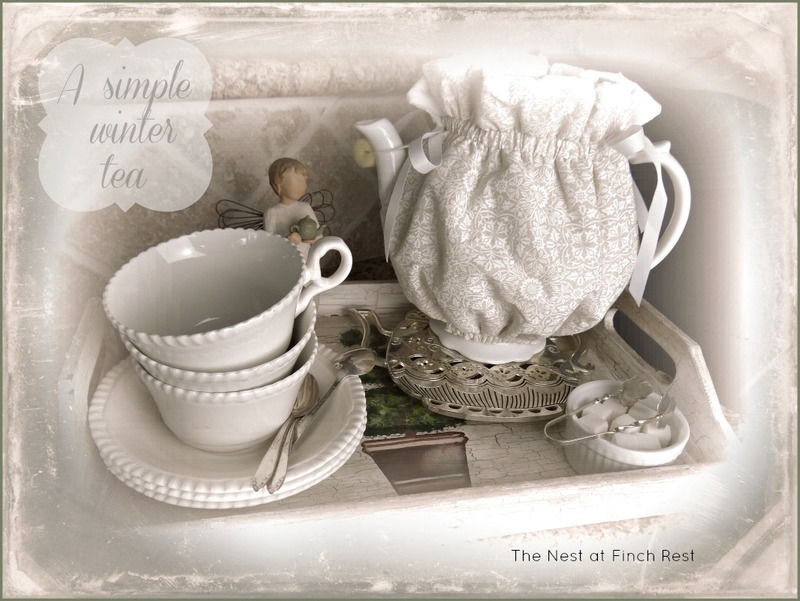 The Nest at Finch Rest: Simple and Easy Tea Time! Simple and Easy Tea Time! I had just enough time to post today. over for a visit the other day. cheap little modern ceramic snowflake plates. and inviting a friend over to share it with you! Don't wait for that "perfect moment,"
becausethere is no such thing! someone's day a little better with tea. Don't forget to enter my pink giveaway! As always, thank you for your visit and sweet comments! Simple tea with a friend are the best! Looks like it was a good time. Simple times with friends are usually the best. Those cups and saucers are so pretty, Michele! Simple in their white coloring, but I love the detail on them. What a beautiful tea party prepared for your friends! 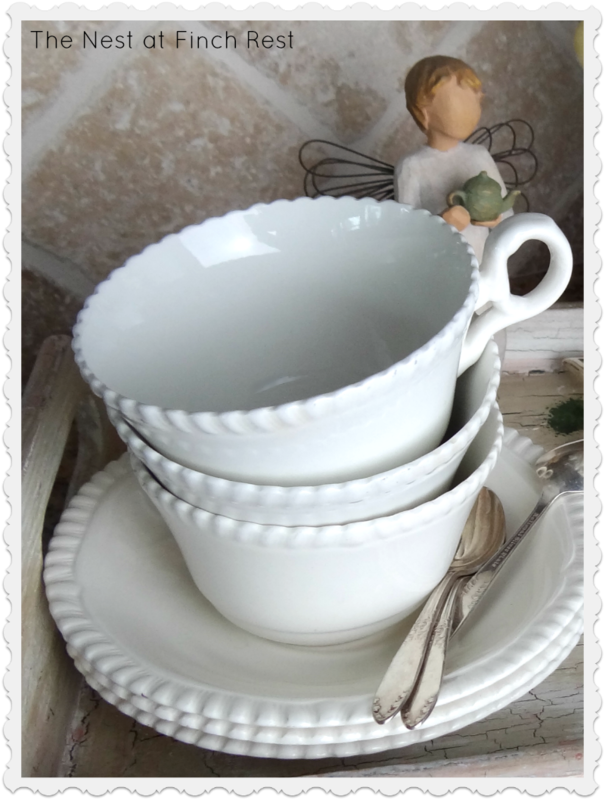 Love the tea cozy on your teapot and your pretty white teacups and the biscotti looks delicious. Wishing you a wonderful week. I celebrate everyday with a pot of tea! It warms my heart and soul. So pretty! I love tea with my mom & sisters. I'm going to go make a cup for myself now. What a special little tea party! It looks lovely! Love all the whites! I couldn't agree more. Just sitting down with pretty cups and a treat can make any get together special. I love your white cups! They look so good with everything. I agree with your tea motto....easy tea is just as valuable as a fancy tea. Tea, toast and a good conversation or a good book is amazing! Winter whites are always in fashion, aren't they! And I love your saying how tea can be quite simple. Yes! Reminds me of that wise old saying about how water and bread can so easily be tea and toast. Love that you are LIVING this out! What a wonderful post, Michele! Love the warm whites and having tea with friends is a real blessing. The cups are really pretty. So sorry I'm late visiting. Trying to type with a sprained hand/wrist is very difficult. Thank you for joining me for tea and have a beautiful day. Simple is sometimes...and often the perfect approach to tea time!! I enjoy "simple" tea time. It's less work which allows for much fun! Good words of wisdom. The perfect time can be now! People always appreciate being invited-especialy, I am sure to your lovely tea settings. You do a great job, blogging, Michele. I always enjoy it. I love the simplicity of white. You can do so much with white chijna. Such a nice pattern! White is always elegant. Nothing better than tea and shopping with friends! Happy Anniversary dearie! It may be simple, but it's certainly lovely! Wonderful Michelle. Eggnog biscotti sounds wonderful. 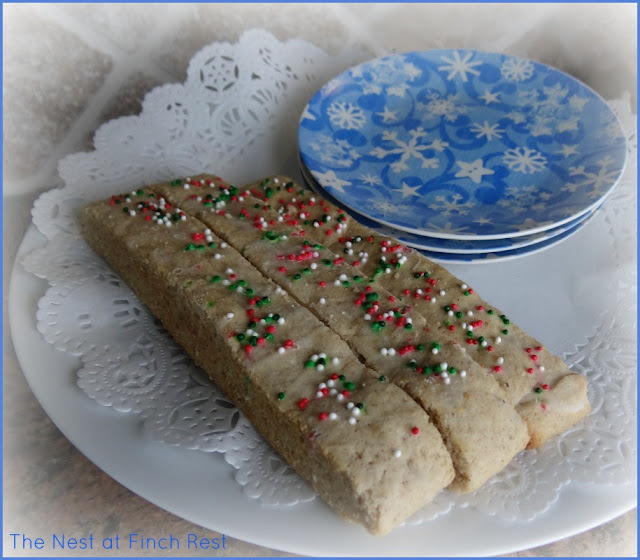 Biscotti are my husbands favorite biscuit for tea, and the eggnog sounds perfect! Thanks for linking to Tuesday Cuppa Tea! So pretty! I love the tea cozy. I want to come over for tea and eggnog biscotti! Yum! You are so right too. I am always wanting things to be perfect instead of just jumping in and having fun. Friends don't want perfect, they want to spend time with you. I need to remember this! So true Michele, it's more about the time spent together than anything else. Simple white is wonderful for Winter. Your biscotti sounds delicious! Thanks for sharing with Share Your Cup. You are exactly right Michele, no time like the present to spent time with friend and share tea. So sweet and so true, take care. Winner of Pink Giveaway Announcement! Beautiful Irish Tea Set Gift!